Being a personal finance blogger, when it comes to choosing a credit card I look at which ones will provide me with the greatest advantage. The amount of cash back, what rewards I can receive and what services the credit card provides at no cost – all of which will ultimately save me money – are the primary factors look for when choosing a credit card. wife: I have to have this credit card! me: You already have a credit card that gives you cash back on every purchase. wife: But it doesn’t have Hello Kitty on it. So, my wife immediately applied for the Hello Kitty MBNA credit card. The worst part? In the past I was constantly asking her to pay for everything with our cash back credit card to earn the free money, but rarely did she use it preferring to pay in cash (the Hello Kitty card does earn points, but the rewards are far less than our other card). Now that she has the Hello Kitty credit card, every single purchase goes on it. 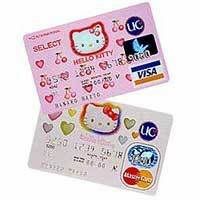 In fact, I wouldn’t be surprised if she has started to buy things just to show everyone her Hello Kitty credit card. While this certainly qualifies as Hello Kitty Hell, I have a much bigger worry. 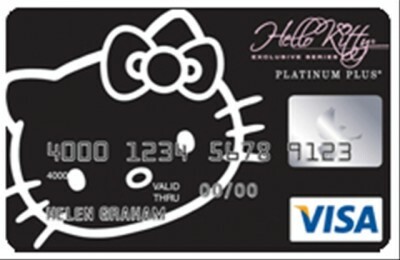 What if they come out with multiple patterns of the Hello Kitty credit card? 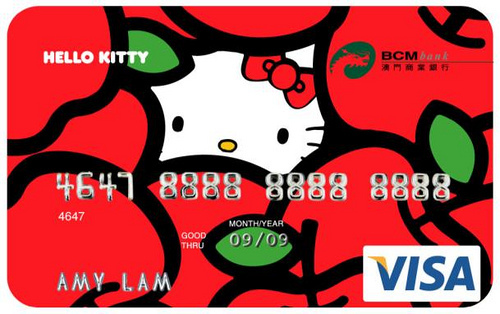 Update: Was there ever any doubt that Hello Kitty credit cards would end up coming out in a multitude of patterns? You have my sympathy, while I love reading of your trials (sorry I get a kick out of it, no holding back the giggles here), I have to reserve it for when my Daughter is not around, I wouldn’t be able to take it as well as you if I were surrounded by that dratted cat! I have enough trouble with the amount of pink ‘stuff’ already here. Unless you pay off your balance every month, I’d be more concerned about the interest rate they’re charging…. I accidently stumbled upon your web, and being a hello kitty fanatic, I only have one question. it’s going to irritate you furthur I guess. can I be your wife’s friend? can I be your wifeâ€™s friend? Explain to her that with the cash back card she can buy more hello kitty stuff with the money she saves. Actually, never mind, that might make the problem worse. Maybe you could, like, epoxy the Hello Kitty card on top of a decent cash back credit card, then you’d have the cute Hello Kitty facade, but pack some cash back muscle. I’m not sure if the double-thick card would slide through the card readers though. It’s definitely worth a try! And if the experiment fails and you make the Hello Kitty card unusable — well, darn! Now THIS is funny.. I’d try to be more logical than that. I’d use the HK card for buying HK things and the other cards for regular things. Now I have to say I stumbled upon your site, but it is going to be the death of me! I want one!!!!! If I didn’t have too many credit cards as it is I would be applying immediately! Sooooo Cute!!! I promise i’ll buy something from her store as soon as my tax refund comes in. What is the website to her store????? Actually, the Hello Kitty credit card has a good APR (7.9% approx.) and you get bonus points for rewards like cash, gift certificates and stuff like that! Plus it is really cute! I have that credit card! It does have a slightly bad interest rate, but I am also 21 and just starting out with credit. I don’t keep a balance on it anyways. I have recieved many compliments while using it though…and it came with a free cell phone holder! I’m in the process of accessorizing one of my vehicles with some more Hello Kitty. I’d love to have an HK paint job!! i totally understand your wife’s need for this card. i already had a credit card but when i saw the little mermaid card available from chase i just HAD to have it. and i definitely love using it. im thinking i might need another one too.. LMAO!!! That is sooo hilarious, but true. I too am a Hello Kitty fan. One day while working a female customer came through my line (I’m a cashier/customer service rep) and whipped out her checkbook and to my surprise it had Hello Kitty on it. Of course, I asked her where she goit in from and in conversation told her that I have a Hello Kitty purse, wallet, and Tinker Bell checks. LOL!!! That is just wrong. Good Luck with the wife. so..i just wanted to tell you and maybe your wife, that there’s another hello kitty credit card. i have it and it’s super cute! it’s black with a white hello kitty face. it’s through bank of america’s specialty cards..she should go look at it..haha! I’m trying to apply for the new hello kitty check card from Bank of America. I like the new black one, but the check card comes with hello kitty CHECKS!!!!!!!! MUST GET THEM!!!!! ah, the one you have pictured is pink. don’t tell your wife, but i’ve seen another version.. it is black with the white outline of the HK head. Does anyone how, as a Canadian, I might be able get this card? I am absolutely obsessed with it! I have that card, and I got compliment from seller everytime I use it at store. awh! I have that card as well, and every time I use it I get a compliment, or it starts a conversation. LOVE it! I will hack into your account and make you go bankrupt if you don’t get my credit card. Any chance of going back to your old card and putting a HK sticker on it? It’s still HKH but at least you’re getting something out of it! I WANT ONEE 😀 ! I WANT THIS CARD!! How do I get it?? Are these pre-paid cards or real card were can i get one! i dont get you… if hello kitty is a hell to you, why were you so eager to create a web page and found cool stuff about her? So I’m assuming by this type of naive mindset that, hypothetically, you would go super gaga over a Hello Kitty “Child” killer knife? It’s so small, pink and cute…. perfect for child killin right?! MINDLESS CONSUMERISM does actually hurt. In all honesty, the cards look pretty cute! But what would make matters worse for you is that if she uses the cards to buy more hello kitty products, and forgetting to pay off the loans. Its like a vicious cycle of hello kitty hell. You need to get out of this system fast!